Michael McFadyen's Scuba Diving - B-25D Mitchell, Madang, PNG The town of Madang is often called the "prettiest town" in the whole Pacific. I must say that I agree with this description as it is very beautiful and ideally located on the shores of Madang Harbour, a harbour that comes close to Sydney Harbour in terms of size, protection and beauty. Numerous parks, lagoons and creeks are found in and around the town and there are plenty of trees that add to its appeal. To the north there are three other harbours, Nagada, Mililat and Sek Harbours. In reality, these are really just parts of the one, huge harbour protected from the open ocean (not that there is any real big seas) by a barrier reef and a number of small islands. The vast majority of the diving here is carried out in and around these harbours. 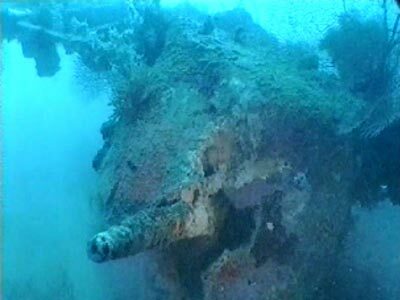 On a dive trip to Madang in Papua New Guinea in 1996, I was able to dive a number of wrecks, amongst them two aeroplanes. 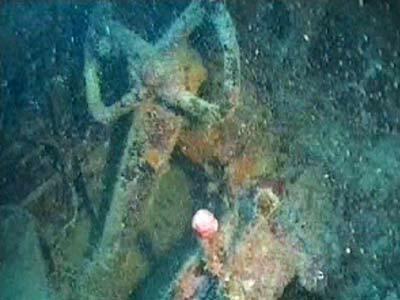 While most people go diving in New Guinea for the reefs, there are some excellent wreck diving all around the country. As well as the famed Blackjack Boeing B-17 located far to the south from Madang, there are a number of other planes to dive in PNG. One of them is a Cessna 402 and the other is a North American B-25D Mitchell. At the northern end of Nagada Harbour in Papua New Guinea north of Madang, there are a couple of islands, the smallest of which is Wangat (or Wangad or Wonad) Island. This island is located only metres inside the barrier reef. 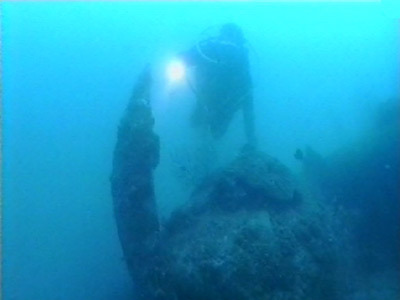 On 5 September 1979, David Pennefather, who was living in Madang at that time, was snorkelling off Wangat Island looking for a rumoured plane when he found the wreck of a North American B-25 Mitchell plane a few hundred metres to the south of the island (this is from Walt Deas and the Pacific Wrecks Database as well as Bob Halstead's book on PNG dive sites - see references below). However, Charlie Edmonds, the then Manager of Jais Aben Resort (not sure if he is still there now), told me in October 1996 that he discovered the wreck with one or two others in 1979. Maybe they are both right, perhaps the snorkeller found the wreck and Charlie and friends (including Pennefather? and definitely Halstead) were the first to scuba dive the plane. Chris Jamesson (see referencesbelow) has advised me that two B-25s are reported as being lost near Madang. One is reported as 3/4 nautical miles (this is 3 to 4 nm I believe) from Madang and the other "off shore at Madang". The first is serial number 41-30118 and the second 41-30183. Therefore it appears to me that the first, 41-30118, is likely to be the plane wrecked off Wangat Island, as this is approximately the distance from the Madang Airfield to the plane. More about this later. North American Aviation Incorporated was responsible for the design and construction of two very famous World War II aircraft. The first was probably the second most famous fighter aircraft of all time, the North American NA-73 P51 Mustang. 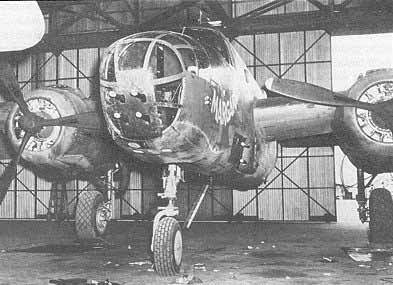 The other was the North American NA-62 B-25 Mitchell bomber. The Mitchell was built in larger quantities than any other US twin-engined combat aircraft and has been often described as the best aircraft in its class during the war. The US Army Air Corps indicated in 1938 that it was thinking of acquiring a medium bomber. North American Aviation Incorporated had already started work on a twin engine bomber as a private venture. This plane, the NA-40 was first flown by Paul Balfour in January 1939. The same month, a competition was announced for medium bombers, with a closing date of 5 July 1939. The prototype, NA-40B, was delivered to Wright Field in March 1939. This plane was destroyed after only two weeks in an accident. The USAAC instructed North American to continue development and the revised plane, the B-25, was completed in September 1939. Despite not being finished, the USAAC issued a contract for 184 aircraft on 10 August 1939 (costing $11,771,000). The first production aircraft flew on 19 August 1940. It had a gross weight of 12,388 kg. The production plane was 15.54 metres long with a wingspan of almost 20.6 metres with a gross weight of 12,909 kg. Power was from the two 1,700 hp Wright Double Cyclone R-2600-9 14 cylinder two-row radial engines with two speed superchargers driving a Hamiliton Standard propeller. Maximum speed was about 443 km/h at 13,000 feet with a ceiling of 23,800 feet and a range of 2,173 km. The Mitchell bomber was one of the most famous aircraft of the war, especially for one raid early in the Pacific war. On 18 April 1942, 16 B-25Bs under the command of Lt-Colonel Jimmy Doolittle took off from the USS Hornet and flew 800 miles to Tokyo and bombed the city. They then flew on to China where they landed. Although little damage was caused, the attack raised morale greatly within America. After the 24 planes were B-25s and then there were 40 B-25As (difference was mainly armour protecting the pilots and self sealing tanks). In 1941 the 1939 order of 184 aircraft was finalised as B-25Bs (119 planes and one written off in a crash before actual delivery). These planes had Bendix dorsal and ventral turrets with 12.7 mm machine guns. A lot of these planes ended up in British hands and 40, destined originally for the Netherlands, ended up in Australia with the 3rd Bombardment Group of the USAAF. In December 1940 the US Government decided to build new aircraft production facilities away from the West and East Coasts where they might be susceptible to attack by Germany if the US ended up at war with Germany (and Japan should it enter the war). The new plants were built in the middle of the country. One of the new plants was built at Kansas City, Kansas (as well as Dallas, Texas). The Kansas plant was owned by the Government but leased to North American Aviation Incorporated. The plan was to build the new light bomber at this plant (as well as elsewhere) with work carried out by North American and Fisher Body Division (a subsidiary of General Motors Corporation), but primarily by Fisher. As it turned out, North American ended up doing most work. The next model was the B-25C. Delivery started at the very end of 1941. The original Inglewood plant made 1,619 planes (not sure where the remaining six were made) . The B-25D was virtually identical and built at the same time. I have read that the B-25D was built at the Kansas and Dallas plants. A total of 2,290 B-25Ds were constructed. An order for 1,200 B-25D Mitchell bombers to be built at the Kansas plant was approved on 28 June 1941. The first two planes were delivered in February 1942. While the initial B-25Ds were almost identical to the B-25C, during the production run there were a number of changes to the base plane. The B-25D had two Wright R-2600-13 1,700 hp supercharged engines (a significient upgrade from earlier models) giving a maximum speed of 485 kilometres per hour and a range of 2,414 kilometres. I assume that the other 1,090 were built at Dallas, although I have also read that all were manufactured at Dallas. There were no B-25E or B-25F produced but there was the XB-25E (one converted B-25C), XB-25F (one converted B-25C) and the XB-25G (one converted B-25C). This led onto the B-25G (400 new planes and 5 converted B-25C). Other versions were B-25H (1,000 planes) and the B-25J (4,318 planes). Some planes were converted to other designations for trainers, transport and reconnaissance and there were US Navy versions PBJ-1C (50 planes), PBJ-1D (152 planes), PBJ-1G (1 plane), PBJ-1H (248 planes) and PBJ-1J (255 planes). All of these were equivilent to the B-25 of similar letter designation. The major changes to the plane (and relevant to this article) relates to the armaments installed on the plane's various models (I will only detail up to the B-25H). The original B-25 and B-25A both had a single 0.30 inch machine gun in the nose (that could be moved to one of three positions), one 0.30 inch machine gun in the waist, one 0.30 inch machine gun in the dorsal position and one 0.50 inch machine gun in the tail. The B-25B had two turrets with twin 0.50 inch machine guns. One was mounted in the belly and the other was on top between the wings and tail. The tail gun was removed. The B-25C (1,625 of them) and B-25D (a total of 2,290) models were constructed at the same time and started off essentially the same and with indentical armaments as the B-25B. The main difference was that the B-25C was constructed in the North American plant at Inglewood. Note that none of these two models had waist guns nor a tail gun (important as you will see later). Starting with the B-25D-5 version, the 0.30-inch machine gun in the nose was replaced with a pair of fixed 0.50-inch machine guns and a single flexible 0.50-inch machine gun. The dorsal and belly turrets remained. Later on, the B-25H was produced. This had a lot of changes to the previous main model the B-25C/D (E, F and G were fairly specialised one-off or short production runs). The main ones were that the dorsal (top) turret was moved forward to a position in front of the wing (two 0.50-inch machine guns with 400 rounds per gun - rpg), waist guns were added (two 0.50-inch machine guns - 200 rpg), twin tail guns were reinstalled (two 0.50-inch machine guns - 600 rpg) and the ventral (bottom) turret was removed totally. In addition, one 75-mm T13E1 cannon was placed in the nose with 21 rounds and four 0.50-inch machine guns installed in the nose with 400 rpg, two 0.50-inch machine guns in individual blisters were now on the right-hand side of the fuselage with 400 rpg and later on, two 0.50-inch machine guns were added in blisters on the left-hand side of the forward fuselage. During the Second World War, a lot of USAAF planes were based in Townsville, Northern Queensland, Australia. From here they did sorties into the South Pacific, especially to New Guinea and the Solomon Islands. In response to troubles with attacking Japanese shipping with the earlier versions of the B-25 and the difficulty of hitting a ship from altitude with a small bombload, an idea was formulated to try low level attacks and skip the bomb off the water into the side of the ship under attack. However, during attacks such as these, the B-25 was very vulnerable to frontal attack due to its poor offensive ability. After some thought, a modification was created in Townsville where the existing nose armaments were removed and a formidible array of guns installed. It appears that the idea of modifying the B-25 (to be called a "strafer") came from a North American Aircraft field service officer, Jack Fox, and Major Paul I. "Pappy" Gunn of the 3rd Bombardment Group. Mr Fox and Major Gunn satisfied General George Kenney, Commander of 5th Air Force in the Pacific, that this was a good modification and approval was given to try it out. However, the first flight of the modified B-25C was not carried out till February 1943. At first I believed that there must have been some other modifications to some B-25D-5s as the plane at Madang is certainly modified from the original state. This was where the original armament of a pair of fixed 0.50-inch machine guns and a single flexible 0.50-inch machine guns was replaced by four fixed (0.50-inch?) machine guns and maybe a cannon (this is not visible on the wrecked plane). In addition, waist guns and tail gun/s appear to have been reintroduced. This was based on the fact that the wrecked plane appears to be a B-25D and has two machine guns in the waist but only one gun in the tail. Thus it is very much like a B-25H but it does not have the twin tail guns and the dorsal turret is between the wings and tail. Therefore the Madang aircraft could have been (and probably was) one of the planes modified in Townsville in 1943. The 38th Bomb Group was constituted on 20 November 1940 and brought into active service on 15 January 1941. Ground crew from the 38th Bomb Group were sent to Australia arriving in Melbourne on 31 January 1942 and travelled to Queensland. They assembled aircraft shipped over from America. On 22 August 1942, the 405th Squadron (known as the "Green Dragons") and the 71st Squadron arrived at Breddan near Charters Towers in Outback Queensland. Walt Deas says that at least some of the planes were flown across the Pacific, taking a week to cover the distance. One of the B-25D-5 models built at the Kansas plant was serial number 41-30118 (chassis number 87-8283). It was received by the USAAF on 13 January 1943. This information comes from the Air Force Historical Research Agency (AFHRA - see references). Walt Deas says that this plane was named Green Dragon with a large green dragon painted on either side of its nose (as was the fashion with all US warplanes). The Air Force Historical Research Agency says that after 41-30118 was delivered to the USAAF on 13 January 1943, it was assigned to Kellogg Army Air Force Base, Michigan on 17 February 1943. It was then assigned to the Sacramento Air Depot, McClellan AAF California, on 28 February 1943. It departed the US on 26 March 1943 and was assigned to the Fifth Air Force, Pacific Theatre of Operations. It was declared missing due to enemy action on 18 August 1943. No other details of the plane are known to the AFHRA. This is consistent with information I have found about the 405th Squadron of the 38th Bomber Group and the modification of B-25Ds. As I indicated above, I think that the Mitchell bomber at Wangat Island is probably serial number 41-30118 which was reported to have crashed on 4 August 1943. The aircraft was said to have been hit by anti-aircraft fire after an attack on Madang. Walt has since told me that this hit the left (port) engine. This confirms to me that this is probably what happened as the plane has no obvious damage from an attack by other aircraft or from the ground except for the fact that the port engine is missing. At first I was working on the assumption that this plane crashed in 1942 (as Walt Deas had posted this date on some sites on the internet) but he has since confirmed to me (as I had suspected) that the correct year was 1943. It appears that the 405 squadron moved to Port Moresby. On its arrival in Port Moresby, 41-30118 was called "Elusive Lissie". It had a painting of a scantily clad woman on the nose (just forward of the cockpit widscreen). It was then renamed "Miss America", with the same painting still used. After this, the plane's nose was repainted with a green dragon. It was then renamed "Green Dragon". 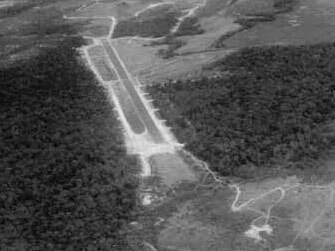 On 4 August 1943, 41-30118 took off from 17 Mile Drome (also called Waigani and later Durand Drome) which is 17 miles from Port Moresby. On the plane on its final mission were Command Officer Major Williston M. Cox Jr (from Tennesse), Pilot Captain Robert Herry (Texas), 2nd Lt. Robert J. Kascelnak Co-pilot (Orange, California), First Lieutenant Louis J. Rittaco, Navigator (Port Chester, New York), T/Sgt. Hugh W. Anderson, Radio Operator (Aspermont, Texas) and S/Sgt. Raymond J. Zimmerman, Engineer/Gunner (Oregon City, Oregon). It flew over the Owen Stanley Range to Madang with the intention of bombing and straffing Madang Airfield. On this mission it was hit by anti-aircraft. After being hit, the plane headed north from the airfield but did not get too far before crashing into the sea just south of Wangat Island. All except Sergant Zimmerman survived the crash. I believe that Zimmerman drowned. The other crew were seen swimming the short distance to Wangat Island. On the island Japanese were waiting and they were captured except for Rittaco. He managed to hide on the island and evade capture. He swam to another nearby island and slept in the Lutheran Church. The next morning Rittaco swam to another village where he was captured and placed with the other crew. Later, they were handed over to the Japanese military police and they were interrogated. Cox was removed from his cell and told he was to be taken to Rabaul. He was taken to the Alexhaufen Airfield and tied to a coconut tree for four days. He was lucky (as you will see). On the fifth day he was flown to Rabaul in a bomber. After eight months in Rabaul, he was shipped to Japan in a freighter. He ended up in Tokyo and in 1945 he was liberated by the Americans. The remaining crew, Herry, Kascelnak, Rittaco, and Anderson were held at the Amron On 31 August 1943 they were exected with another airman. Herry was killed by mutiple stabs from many bayonets. The others were beheaded. As mentioned, Major Cox ended up a prisoner of war in Japan and survived the war but a web site dedicated to the 38th Bomber Group says that Major Cox was killed in action on 4 August 1942 (note date). However, Walt Deas told me that he spoke to Major Cox's son and saw newspaper reports of Major Cox's return to the US so this site is obviously incorrect (probably based on missing in action reports with the year wrong). The only other member of the crew listed on the above site as being recorded as killed or missing is T/Sergeant Hugh Anderson. Walt has contacted a few relatives of the crew for a documentary on the aircraft. This documentary is called "The Bomber Reef" and is now out on DVD. It has the full details of the bomber and its crew. Contact Walt as per the references below for more details on how to purchase. As I indicated above, I had at first thought that the plane located off Wangat Island was a B-25G or H, or a G modified to be a model H. The basic B-25G as modified had a top turret (located towards the rear whereas later models had the turret over the cockpit), a rear machine-gun, two waist guns as well as a fearsome six or eight guns facing forward. 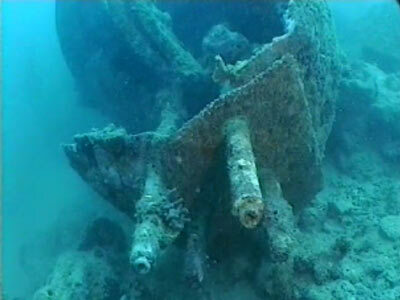 There were four guns in the nose and either one or two located either side of the cockpit. The plane at Madang certainly has four guns in the nose but I cannot tell if it had more on the side of the nose. I was told by Raymond Holyoak (see references below) that this plane was probably one that was assembled and modified at Base Two in Duckworth Street, Townsville, Queensland. These were crated over from the US, had their perspex nose removed and had the extra guns installed. As mentioned, the plane was discovered in 1979 by David Pennefather. Within a few days, the machine guns in the waist were stolen as were the guns on the side of the nose. The plane off Wangat Island is located at a depth of 15 to 25 metres. It is fully intact except for the port engine which is missing, the port wing tip is at 15 metres and the starboard wing at 25 metres. 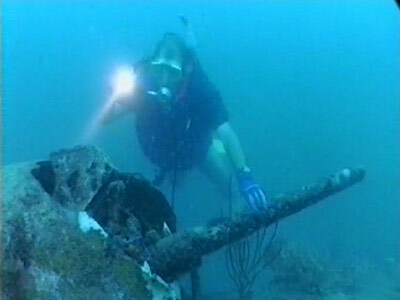 The main body of the plane is about 18 metres deep. Starting from the front, the four 0.5 inch guns are very obvious and through the damaged nose section the four ammunition hoppers that fed the guns can clearly be seen. There is still a considerable number of rounds still in the hoppers but they are cemented into place by concretions. The cockpit is open and a small diver can fit inside. The controls are still there (throttles, wheel), but all gauges are long gone. Behind the cockpit there are two huge hoppers that feed the side guns (so this impies that there were at least two extra guns - I will have to check my video to see what side they were on). 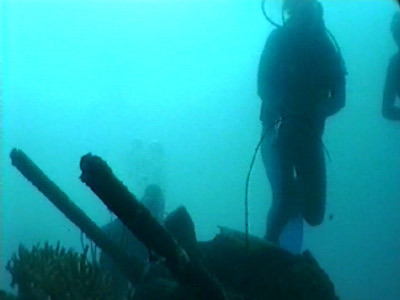 Bob Halstead said in his article in the March 2007 issue of DIVE Log that the gunes were pilifered soon after the plane was discovered. Behind here you can see the bomb-bay and navigator's area. The back section of the plane can be viewed, but the only entrance is through the port and starboard waist bulges (gun spots) but these are far too small for anything but your head. The turret can be examined (it was remotely operated) and the periscope that enabled the operator to sight the enemy can be clearly seen. Inside the turret you can see the ammunition (0.50 inch) in the hoppers that feed the twin guns. The rear gun appears to be only a single gun. Between the huge twin tail fins (which were fabric covered on the rudder section, now missing) there is an enormous gorgonia fan. 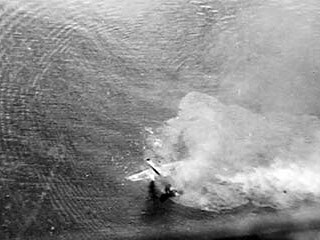 As indicated earlier, the starboard engine is intact and the engine appears to have been running when it hit the water as the blades of the propeller are all bent backwards by the force of the water. The port engine is missing, neatly ripped away, whether by the crash or an earlier incident (eg, enemy fire or a major malfunction). This is consistent with Walt Deas's belief that it was hit in the port engine by ground fire. There is no apparent damage from gunfire to the wings or body of the plane. The water temperature for this dive was a minimum of 29°C, extremely pleasant. The visibility ranged from eight to ten metres, more than enough to fully enjoy the plane. 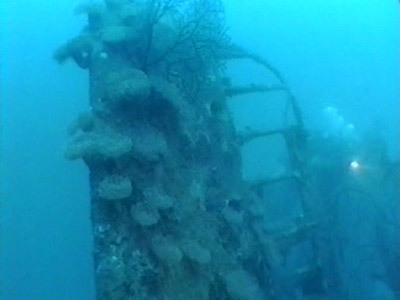 A short video on the wreck shot in 1996 will be placed here on about 27 August 2009. E-mail from Chris Jamesson concerning B-25.